When you come to a service at St Peter’s, there is always someone to welcome you and make sure you have what you need. These Sidesmen and Sideswomen – often called Sidespeople – welcome everyone as they arrive, handing out service books, hymn books and other useful information. They make sure the ramp is in place when needed and help everyone find a seat or space. For anyone with children, they’ll point out the ‘crèche’ area by the font and the opportunity, if they want, to join the Sunday Club, during the Sermon at the main Sunday service, in the Vanderstegen Chapel. 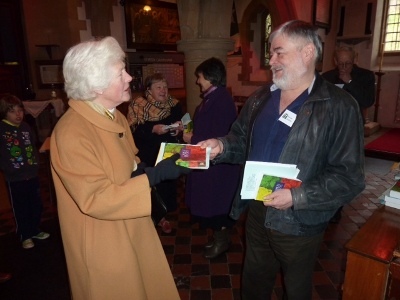 Before the service, Sidespeople make sure readers are ready to read their lessons, the bread for communion has arrived, if necessary, and that whoever has brought it has a well-briefed team in place for the offertory procession. During the first hymn, Sidespeople count the congregation, split between adults and children under 16, for the Church records. They take the collection during the offertory hymn, taking it up to the altar when complete, and help the congregation to the right altar during communion, avoiding traffic jams in the aisles. At the end of the service, they collect in the books, help people as needed, tidy up the pews and enter the collection and attendance figures in the service book. Should it be necessary, sidespeople are also responsible for fire safety and the evacuation of the Church.